The world’s largest and tallest high-rise building built to Passive House standards is coming to Roosevelt Island. Commissioned by Cornell University for their new Cornell Tech Campus, the sustainability-focused residential tower designed by Handel Architects will be a model of energy efficiency and could even save 882 tons of CO2 per year—the equivalent of planting 5,300 new trees. The airtight apartment tower will also be one of the country’s largest net-zero buildings and generate energy on-site through geothermal systems and solar energy. 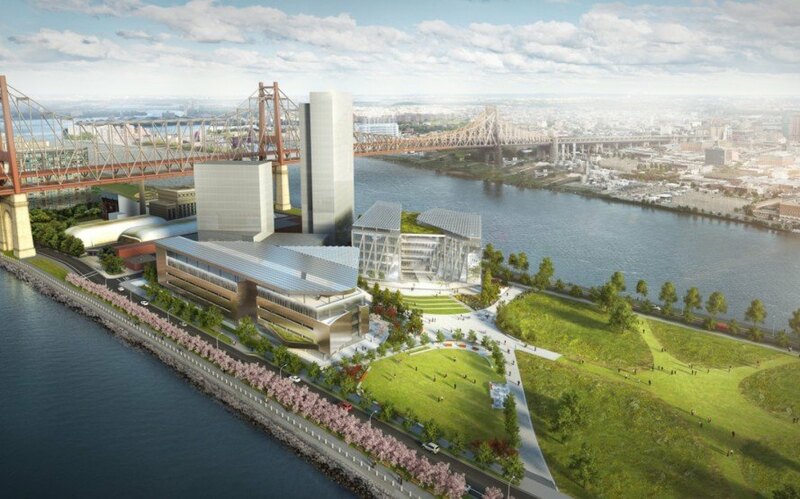 Developed by Cornell University, Hudson Inc., and Related Companies, the two-million-square-foot Cornell Tech University Campus is envisioned as “a campus built for the next century” that also aims to be one of the most environmentally friendly in the world. To live up to its ambitious goals, the project features the designs of many acclaimed firms including Weiss/Manfredi Architecture, Handel Architects, Morphosis, Field Operations, and SOM. All of the buildings and site elements will be designed to green building standards such as LEED and Passive House. Handel Architects’ 350-unit residential building will tower above the campus, soaring to a height of 270 feet. The 26-story building will serve as an eye-catching landmark and will be coated in special color-changing paint that will shimmer in the light to change hues from silver to warm champagne. The high-rise will house around 530 graduate students, faculty, and staff, and is expected to consume 60 percent to 70 percent less energy than conventional buildings of the same size. To achieve those energy savings, the architects had to make the building airtight and orient it to capture southern sun, while minimizing unwanted solar gain. The facade will be built from thick prefab panels that comprise triple-glazed windows, metal, and insulation. The facade will open up on the southwest facade to reveal a louver system—the “gills” of the building—that contains the heating, cooling, and circulation equipment. Energy-recovery units will harness heat from outgoing exhaust air and transfer it to incoming fresh air to reduce heating needs. The building is slated for completion in 2017. The Cornell Residential Tower is projected to surpass the world’s tallest passive-house building, the 20-story Raiffeisenhaus Wein 2 office tower in Vienna, once it receives official certification from the Passive House Institute. Handel Architects’ 350-unit residential building will tower above the campus, soaring to a height of 270 feet. The 26-story building will serve as an eye-catching landmark and will be coated in special color-changing paint that will shimmer in the light to change hues from silver to warm champagne. To live up to its ambitious goals, the technology campus features the designs of many acclaimed firms including Weiss/Manfredi Architecture, Handel Architects, Morphosis, Field Operations, and SOM. Developed by Cornell University, Hudson Inc., and Related Companies, the two-million-square-foot Cornell Tech University Campus is envisioned as “a campus built for the next century” that also aims to be one of the most environmentally friendly campuses in the world. All of the buildings and site elements will be designed to high green building standards, such as LEED and Passive House. The high-rise will house around 530 graduate students, faculty, and staff, and is expected to consume 60 percent to 70 percent less energy than conventional buildings of the same size. The facade will opens up on the southwest facade to reveal a louver system—the “gills” of the building—that contains the heating, cooling, and circulation equipment for the building.